Carmine T. DiNoia Jr., 87, of Westerleigh, a lover of life, passed away on July 28, 2016. Born in Elm Park, Carmine graduated from McKee High School and served in the Army during the Korean War. He was a foreman for the DEP and retired in 1982. He enjoyed spending time with his family which was the most important part of his life. He loved the beach, making wine, gardening and was an avid reader. Surviving are his daughters, Marie Bellucci and John, Teresa DiNoia-Rodriguez and the late Alex, Diane DiNoia-Neville and Pat. 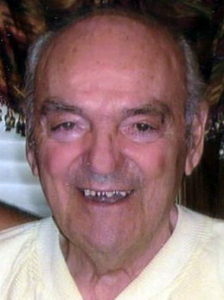 Carmine was predeceased by his first wife, Josephine (nee Giaccio) and his second wife, Marie (nee Rispoli); a sister, Anna DiMauro; three grandsons and two great-grandchildren. Funeral from the Cherubini McInerney Funeral Home, formerly Meislohn-Silvie Funeral Home, 1289 Forest Ave., Staten Island, N.Y., on Saturday. Mass is at Blessed Sacrament Church 10 a.m. and burial at St. Peter’s Cemetery. Friends may call Friday from 2 to 4 p.m. and 7 to 9 p.m.
Offer Condolence for the family of Carmine T. DiNoia, Jr.